There are a variety of barrel sizes. Please call to find out the size options available in your town. 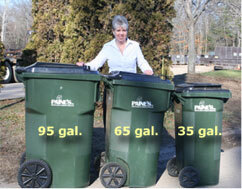 Ask us about our “Together Let’s Trash Cancer” Pink trash barrels to see if they are available in your area. What types of items can I put in the barrels? Regular household trash that is not recyclable or hazardous belongs in the trash barrel. This includes bag-able items like broken knickknacks, product packaging, foam containers & soiled items. Regular household Recycling that is not rubbish or hazardous belongs in the recycle barrel. This includes clean and empty plastics 1-7 & food grade glass jars. Also paper products like junk mail, corrugated cardboard & cereal boxes. See Recycling and Hazardous Waste for additional details. When do I put out my barrel? Our routes start early so you should have your barrel out by 6:00 am on your collection day. Please feel free to roll them out the night before. If you are unsure of your collection day please refer to our Street Look Up tool or feel free to call our office. Where do I place the barrel? Please place the barrel with the handle facing away from the street, within 2 feet of the curb. Make sure it is free of any obstructions. For example: Cars, lamp posts, planters, mailboxes, stone walls, shrubbery and/or your recycle barrel. Removing any obstacles alleviates any interference with the trucks automated arm which needs to wrap around the barrel in order to pick it up. Why was recycling collected, but not garbage? Garbage is collected on the same day as your recycling but weekly and by a separate truck, at a different time. If your barrel is still full it may be that the garbage truck just hasn’t come yet due to things like traffic accidents, weather events, and school buses that may have caused the trucks to re-route. Please feel free to call our office with any questions concerning your collections. How do I fill my trash barrel? All acceptable rubbish items can be bagged together and placed in your garbage barrel, no special bags required. This will keep smaller items from blowing out and keep the inside of your barrel cleaner. Please remember think before you toss. If an item can be recycled through the single stream system or through a recycle drop off program that is where the item should go. Remember, it is okay for the barrel lid to be slightly raised up. If you still have additional that will not fit in your barrel please contact us to find out what the options are for removal in your town. Please note that we offer dumpsters and/or roll-off containers for large items and larger quantities of rubbish removal. What if I put it out too late or on the wrong day? Please contact our office to see what options may be available in your town. What is the number on my barrel for? The number identifies your specific barrel (Both trash and recycling have different numbers). It’s a good idea to record your barrel numbers in case it gets lost. If you have a flag that needs to be retired, you can do so locally by dropping the flag off directly to Paine’s located at 54 Floydville Rd, East Granby, CT.